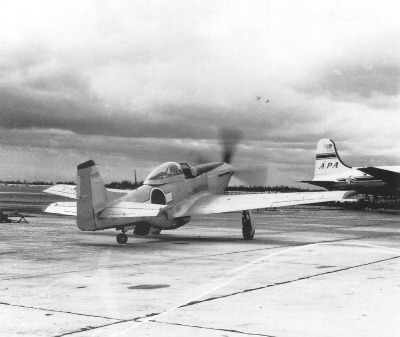 The Dominican Republic received surplused P-51D's from Sweden 1952/1953 as an addition to a few aircraft purchased from the U.S. during the late 1940's, and kept them in continuous service for over 30 years until finally retired in 1984 ! During that long service-life, the aircraft saw several IRAN's (Inspection and Repair as Necessary) and upgrading, mostly done by TFA / Cavalier at Sarasota, FL. A few aircraft were added from other sources to replace losses, and some aircraft were cannibalized for spare parts. 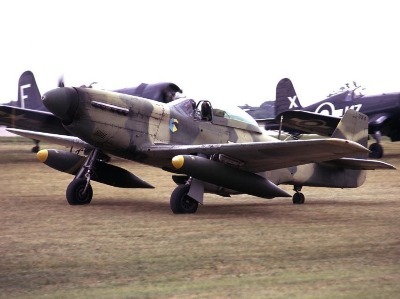 An early photo of ex-Swedish AF P-51D's. FAD-1931 is ex Swedish AF Fv26016, original USAAF serial 44-63743, while FAD-1930 is former Swedish AF Fv26090, original USAAF serial 44-72395. 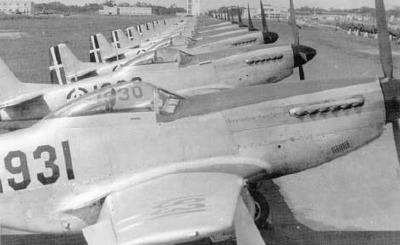 A line of of P-51D Mustangs at San Isidro Air Base during 1955. 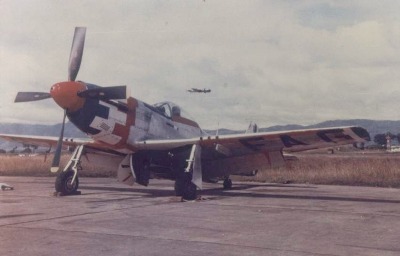 Seen here is one of the most colorful military P-51 markings, the one of Escuadron Caza de Ramfis. Individual flights had different nose colors, i.e. red (as seen here), blue and yellow. All shared the vicious shark mouth. 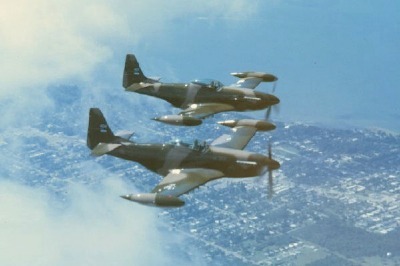 Mustangs of the FAD (Fuerza Aerea Dominicana) during the 1970's. 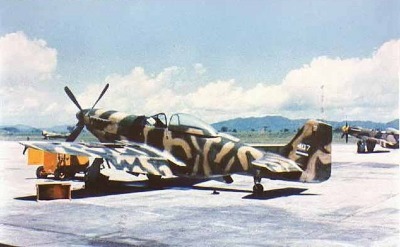 The camouflage scheme was introduced during that time. 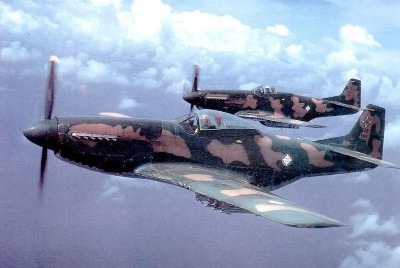 Nice in-flight study of two FAD F-51's during the last year of this type's service in the Dominican Republic. Nearest aircraft is FAD-1912. 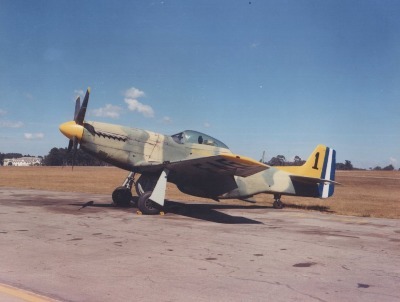 This photograph shows a highly polished FAG P-51D early in its service life. The identity of the aircraft is not known, but judging from the badge below the canopy, this could be FAG-315. 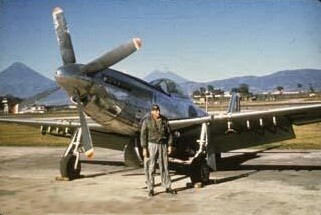 The Fuerza Aerea Guatemalteca (FAG) was another long-time user of the F-51 Mustang - Starting from August 1954, some 20 aircraft were acquired from various sources as frontline fighter aircraft, but it also saw use against Guerillas until retirement in 1972. Some of the aircraft received during the early 60's had seen upgrades and modifications at TFA (Trans Florida Aviation) at Sarasota, FL. Seen here at the TFA facility at Sarasota, FL, during October 1961, this Mustang carrying civil registration N9152R soon was to change into military colors again, becoming FAG-372 upon delivery to Guatemala in February 1962. 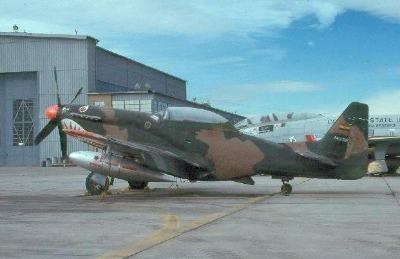 Former 44-74831 and RCAF-9268, it's ultimate fate in Guatemala is unknown. 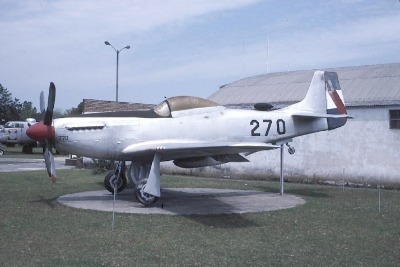 FAG-375 of the Fuerza Aerea Guatemalteca (FAG) before camouflage paint-scheme was introduced. 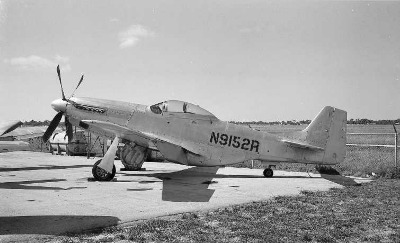 This is ex P-51D-30-NA 44-74854. 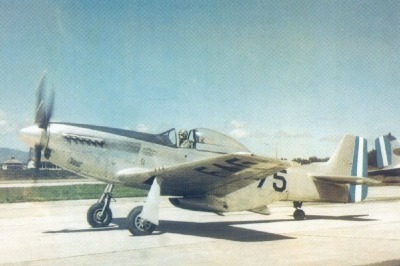 Guatemala also maintained a demonstration team equipped with F-51 Mustangs. Initially know as "Los Machitos" ca. 1955, the name was changed to "Los Cofres" ca. in 1957 and during the early 70's the team was known as "Quetzales". 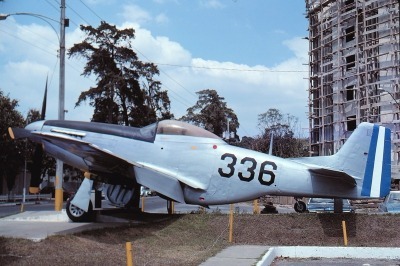 FAG-360 on display in Guatemala City, when it was first presented as a "Monument to the men and machines who cross the skies of a free country" across from FAG HQ back in the 1970s. 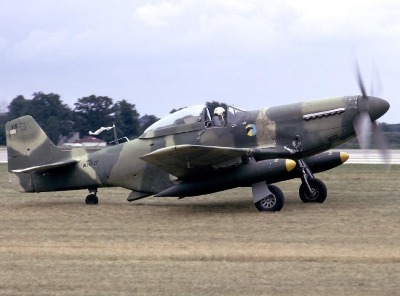 This aircraft later was stripped of its camouflage paint and re-serialled "FAG-336" to represent the aircraft flown by the CO (Commanding Officer). Thanks to Tulio Soto for this info. 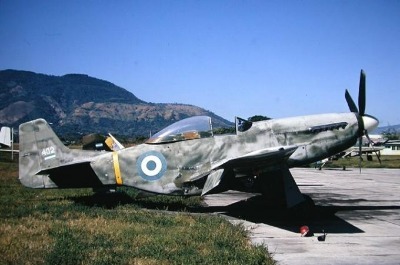 The same aircraft seen here after its metamorphosis to "FAG-336" (photo John L. Dienst via Tulio Soto). FAU-262 during delivery on 4th December 1950; on the original photo, the former USAF serial, 44-63559, is visible in handwriting on the tail-fin. 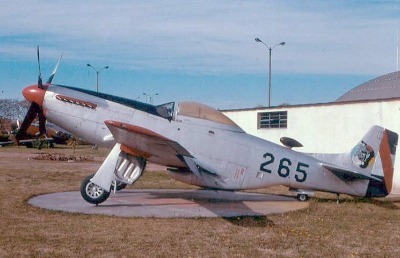 FAU-273 of the Fuerza Aerea Uruguaya (FAU) - ex 44-63618. FAU-265 on display at the FAU Museum - ex 44-63577.
another preserved example, numbered FAU-270 at the Museum - this a/c eventually was sold to the U.S. in 1984, and currently is in the process of being restored to airworthy condition - ex 44-63613. 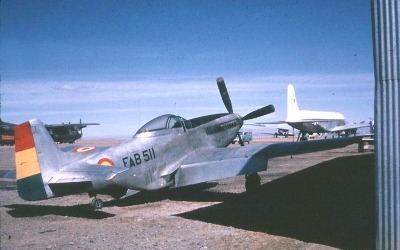 Initially, the P-51's supplied to Bolivia were left unpainted except for the nationality markings on wings, fuselage and rudder. FAB-511 is a former Air National Guard veteran originally serialled 45-11453. It was delivered to the FAB in June 1966. 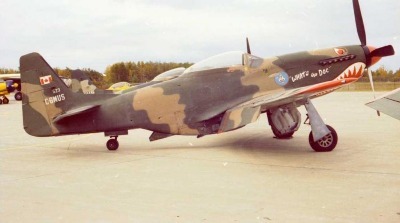 FAB-523, a Cavalier Mustang II delivered to Bolivia early 1968 under MAP project "Peace Condor" (USAF serial 67-22581) seen here shortly after imported to Canada as C-GMUS (Doug MacPhail). FAB-519, another Cavalier II received under project "Peace Condor" in 1968 (USAF serial 67-22579) shortly after retirement and receiving civil registration C-GXRG 1977. Note the different camouflage pattern when compared with FAB-521 above (Doug MacPhail). 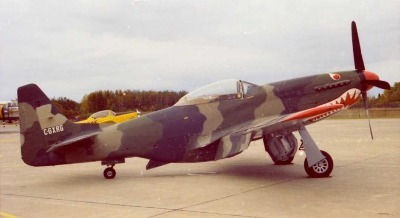 FAB-521, a Cavalier TF-51 conversion (USAF serial 67-14866) seen here upon arrival in Canada in 1978 - it became C-GXUR and later N20TF. FAR-401 of the Fuerza Aerea Rebelde (FAR) in Cuba on display (Ruben Urribares). 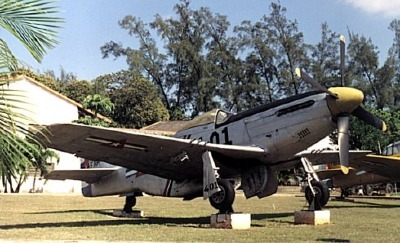 Another view of the same aircraft on display in Havana (Ruben Urribares). 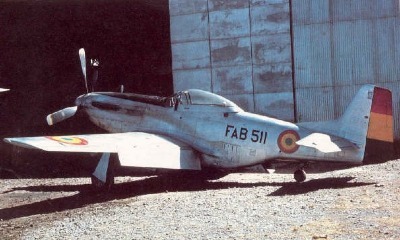 FAS-407 of the Fuerza Aerea Salvadorena (FAS) in a very unusual camouflage scheme (Museo Nacional de Aviacion). FAS-402 seen here in 1972. 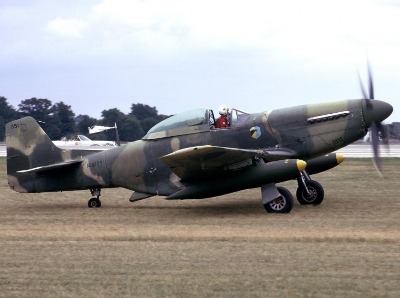 This actually was the 2nd aircraft to be allocated this serial and was a civilian Mustang retrofitted for military use; the former civil registration being YS-210P, ex P-51D-25-NA 44-73350. 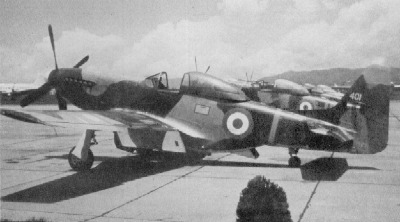 FAS-404 and FAS-405 of the Fuerza Aerea Salvadorena before delivery late in the 60's. These ships actually are Cavalier II conversions - not the higher tail fin and the wingtip-tanks. 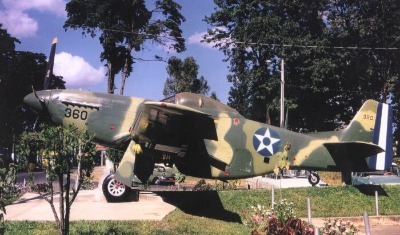 FAS-404 reportedly is the aircraft that was shot down by a Honduran Vought F4U-5 Corsair during the 1969 war - the last aerial battle between piston-engined fighter aircraft. The nearest aicraft in this line-up of participants in the so-called 1969 "Soccer-War" between Honduras and Salvador is FAS-401, a Cavalier II coversion delivered in 1968. 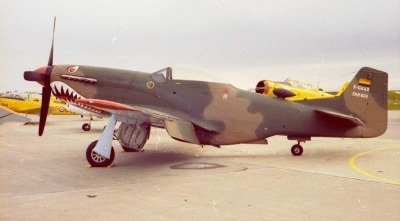 As comparison to the color photo above, the wing-tip tanks on this aircraft have been removed. The camouflage scheme is green and brown with light grey undersurfaces. 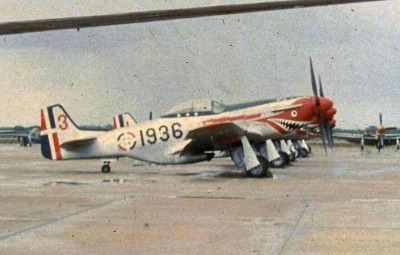 Haïtian Air Corps #15655 taxying at Miami, FL, during the 1950's. 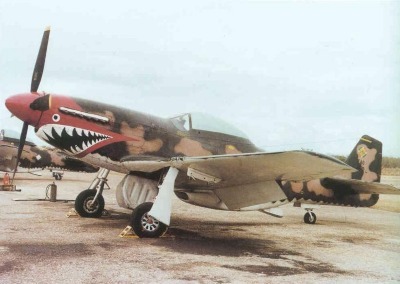 USAAF serial was 44-15655, identifying it as a P-51D-15-NA (via Tulio Soto).